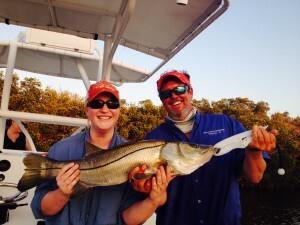 On Thursday, April 24th 2014, my wife and I (Jana) and some friends (Amber and Seth) of ours, took a charter fishing trip with Joel from Ana Banana Fishing. I am an avid bass fisherman, and have spent many days fishing on the North Carolina Outer Banks, but my wife and our friends…not so much. 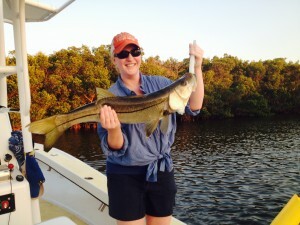 My goal was to catch a Snook, and to check that fish off my “Bucket List”. Joel assured me that he would put me on a Snook. After a quick (but choppy) run into the bay and a few throws with the cast net later, Joel had caught all the Greenbacks that we would need for our 4 hour trip. While we were out there, he made the suggestion that we see if the Spanish Mackerel were chasing the nearby bait. He and his mate baited us up and before all of our rods could even get in the water, Amber had hooked into a nice sized Spanish. The Spanish kept coming and we kept fighting them for an hour. We even hooked into something that spooled Amber’s reel in 15 seconds. Shark? Big King? Who knows, but it was awesome. We left this spot and went to an area where Joel said he would put us onto some Snook. 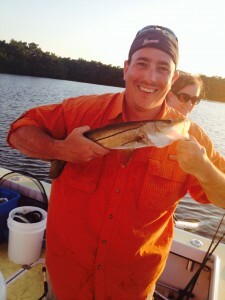 Within a few minutes, we were pulling in under-slot sized fish and my first ever Snook! The two best moments were still to come. A MONSTER started taking line from Jana and it was all she could do to keep the rod tip up. After a couple of minutes of reeling, and me h olding the rod tip up for her, she landed the largest Snook you can keep in the state of Florida. A monster, just under the top end of the slot. A couple of minutes later, I hooked into and boated an undersized Speckled Trout, and within minutes, rounded out my West Florida Slam by boating a nice slot Red Drum. It was a great day. 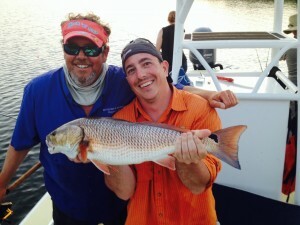 Everyone caught fish and everyone had a blast. As we were riding back to the launch while watching the sun set over the bay, we all decided that next time we come to Florida, we will DEFINITELY be giving Joel a call again. He was personable, knowledgeable, didn’t mind baiting hooks for the ladies and took us straight to the fish. If you’re ever in the Apollo Beach/South Tampa area of Florida’s West Coast, each of us on the trip would recommend him for your fishing adventure. Tight Lines!